As Newport’s neighbor to the north, Huntington Beach shares the “road of dreams”, better known locally as PCH or Coast Highway, or formally known as The Pacific Coast Trail. 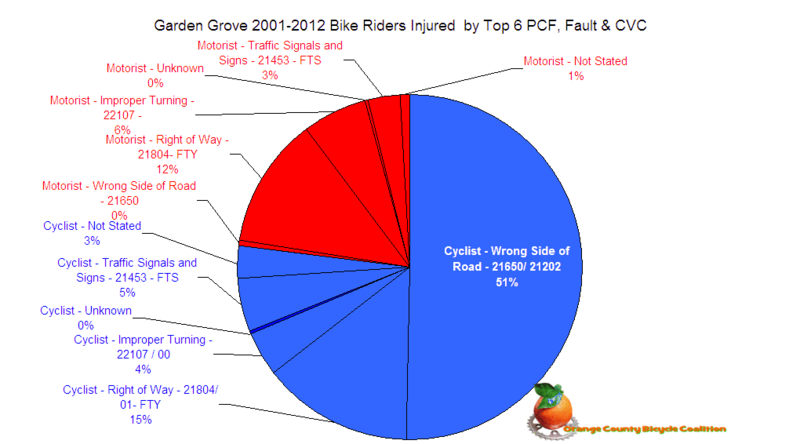 Garden Grove edged out Huntington Beach in a tie with Newport Beach for “bronze” or third place in the most dangerous cities to ride a bike in the county leaving HB to “improve” to 4th place. 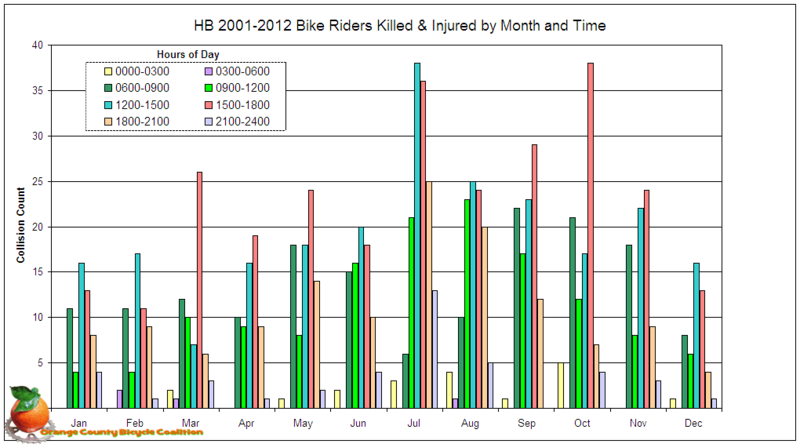 10 bike riders were killed with 1,055 injured since 2001. 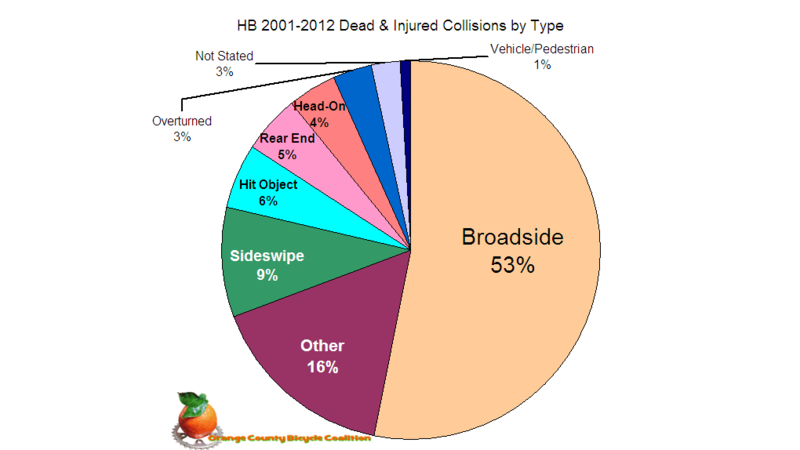 RT 1, or PCH and Brookhurst are two roads where half of fatal rider collisions occurred. The most current Huntington Beach records are from 7/28/12 which shows at least some county records are making it to the CHP. 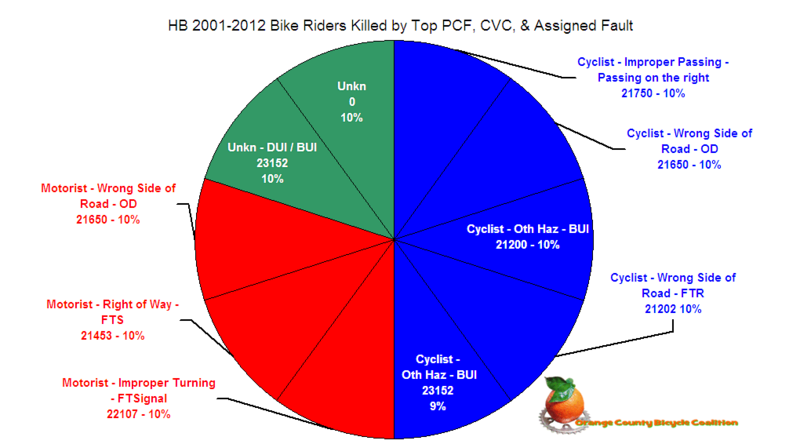 According to the assigned fault as shown, bike riders were responsible for their own death 49% of the time although 20% of the fatality’s fault was undetermined so it could range as high as 69% . 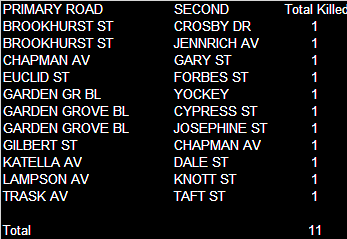 Rider faults seem evenly split until you notice that 2 are due to BUI or Bicycling Under the Influence, with another DUI/BUI listed in the “unknown” category making 3 riders dead thanks to the impairment of some intoxicant. Drivers in Huntington Beach failed to stop, signal, or drive on the right side of the road resulting in another 3 riders dead. 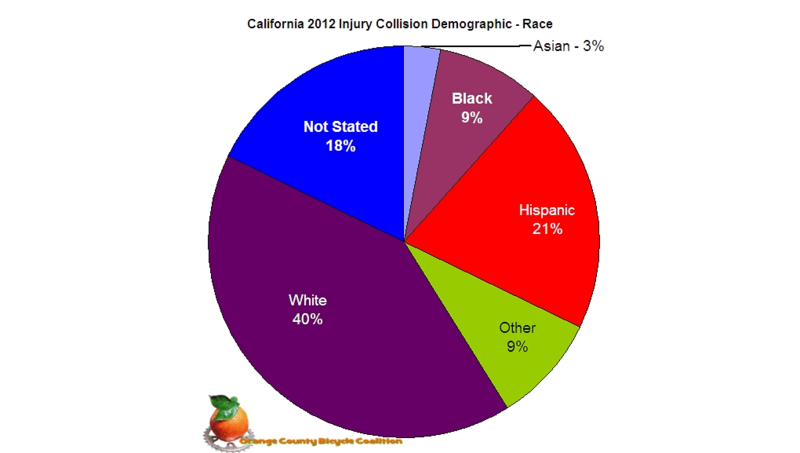 Riders were responsible for just under 75% of their injuries by colliding with other vehicles. 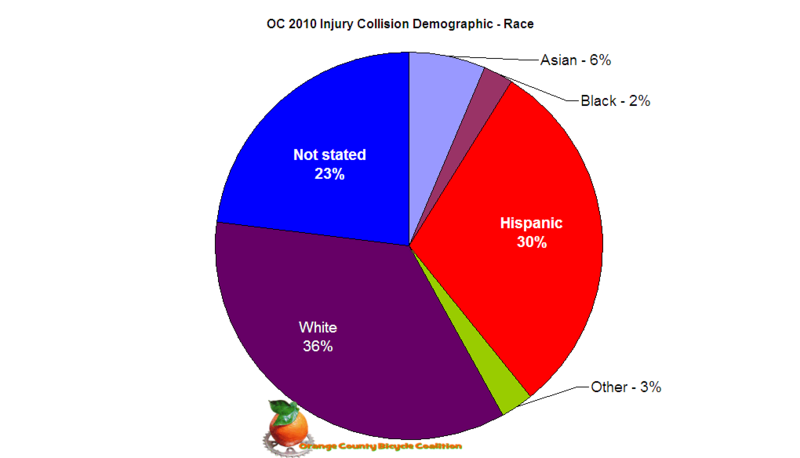 Just like in Santa Ana and Garden Grove, riding on the wrong side of the road, or not far enough to the right to suit the citing officer is the predominant cause of collisions. Given the tourist factor and beach-side flavor it is more likely that wrong way riders aware of the proper rules of the road, choose to ignore them to make their way about HB. Better signage and road treatments like sharrows could help direct riders to “go with the flow”. Selective enforcement actions also would help reduce rider collisions perhaps by issuing warnings, then citations for repeat (observed) offenders. Certainly an educational outreach is needed and in fact, rumor has it that a class is scheduled this coming November 15th with the on-road portion on the 17th at the Rodgers Senior Center. We could not confirm the class schedule or registration because it’s not listed on the calendar as yet, and at press time the online registration system was out of service. Should things get back to normal, online registration will be available at www.hbsands.org. Check the City’s calendar for updates, or see the class announcement here. One third of collisions occur between 6 a.m. and noon, with 50% happening from noon till 6 p.m. which might indicate too much sun and suds for clear riding judgement. 17% of collisions happen from 6 p.m. to midnight, while the hours from midnight to 6 a.m. account for the rest at less than 3%. With almost half of injury collisions occurring due to riders riding “against the flow”, we see an almost perfect correlation to the expected outcome with 53% of riders being broadsided. 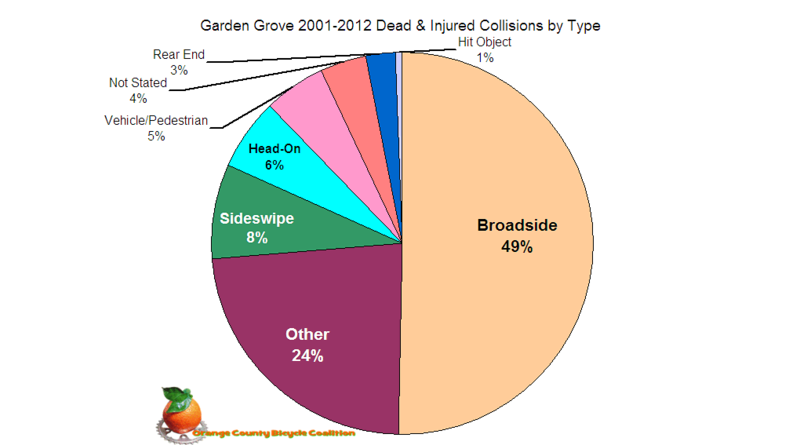 Again, it would be wrong to to notice broadside collisions, with a predominate wrong way riding to infer that riders are getting broadsided because they aren’t where they’re expected to be, as drivers aren’t looking for traffic coming from the right. That would be just wrong so we won’t do it. Huntington Beach has a tough challenge to make the streets safer for everyone, from the busy tourist beach scene, to the bustling inner streets of the city. We’re encouraged that they are almost midway through the development of a draft City Bike Plan, however much can be done before the plan is complete to mitigate behavioral causes for collisions as noted above. We welcome working with city and county staff and other agencies to develop an effective outreach program to better meet the safety needs of all bike riders in the city. Keeping our tradition of “slicing the Orange”, we present the latest statistics for Anaheim. 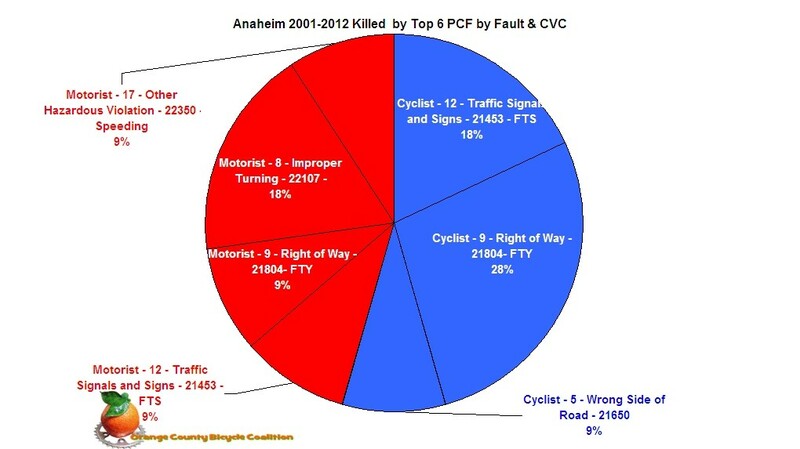 Anaheim is the 2nd worst city for bike collision fatality and injury in the county. With 13 dead and 1,048 injured since 2001, we sought to unravel a common denominator. Even the happiest place on earth is not immune to deadly collisions as seen by the fatality created by a speeding motorist at Ball and Cast Place in Disneyland last year. The latest records from Anaheim are from 2/24/12. 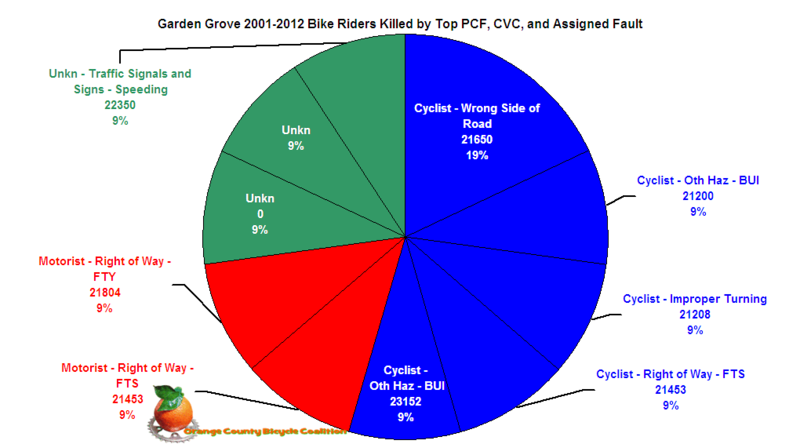 Once again, bike riders are their own worst enemy according to the authorities. Failing to stop, riding on the wrong side of the road, and failing to yield are 3 simple things these riders should have done and had they done so, there would be more bikes on the road today. After all, how often do you hear someone saying, “I wish there were more cars on the road! Motorists were also guilty of carelessness resulting in an additional needless loss of life by speeding, and generally failing to maintain or exercise proper control of their vehicles. 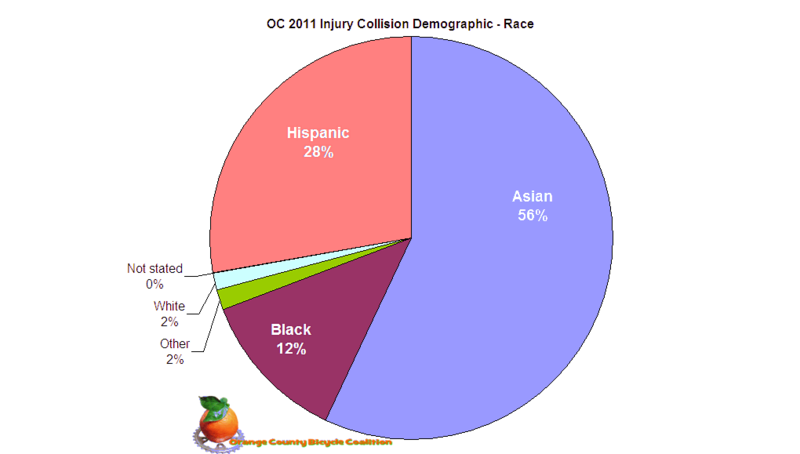 Bike riders in Anaheim must really like pain because according to the data, they are responsible for over 80% of collisions with motorists. Now I have yet to meet one cyclist who actively looks to get into a collision with a car, truck, or tank, so I would treat these numbers with some suspicion. Five simple things that you can count on one hand. 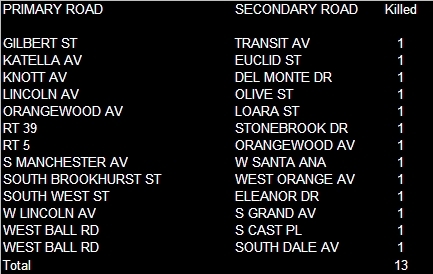 Master these and watch Anaheim switch sides from one of the worst, to one of the best cities to ride in. It all starts with you. Yes, there are infrastructure issues as well. For this reason, roadway treatments in one city need to be coordinated with the the adjacent city, and so on. 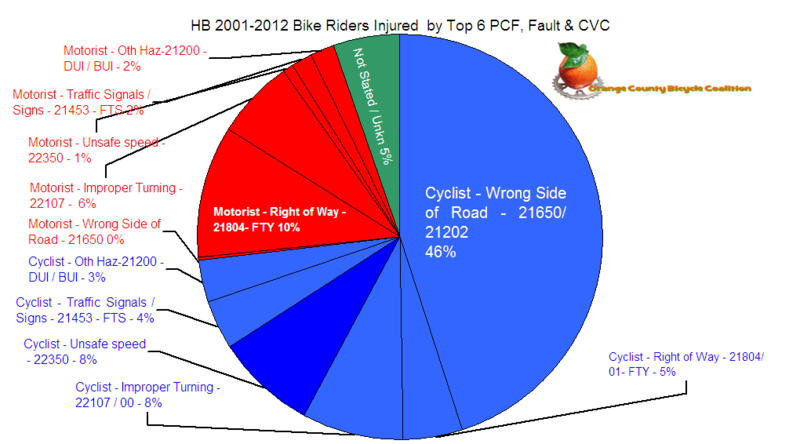 In fact, we looked at all the roadways involved in collisions and found that 20% of all collisions happened on 5 roads. 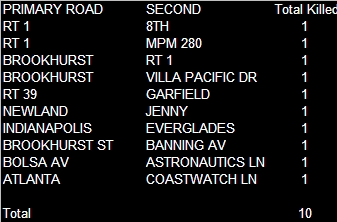 Certainly some room for improvement there, can you guess which roads / streets they are? 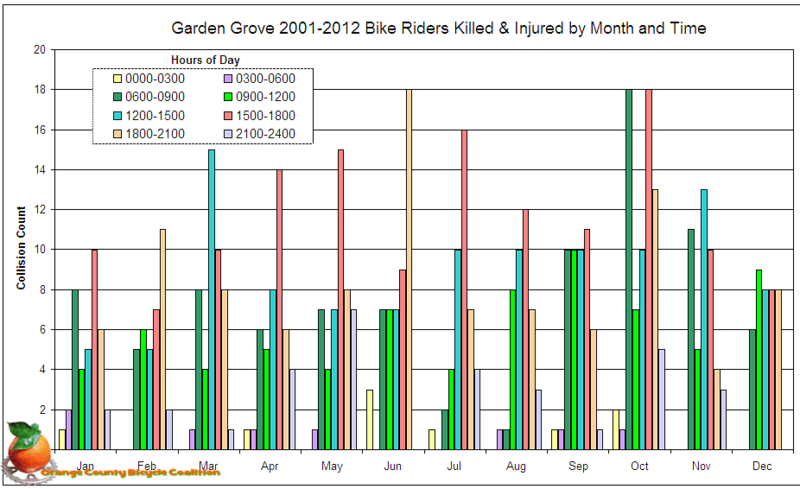 An active and engaged Bicycle Action Committee is needed for this city – stat. Who is willing to rise to the call? 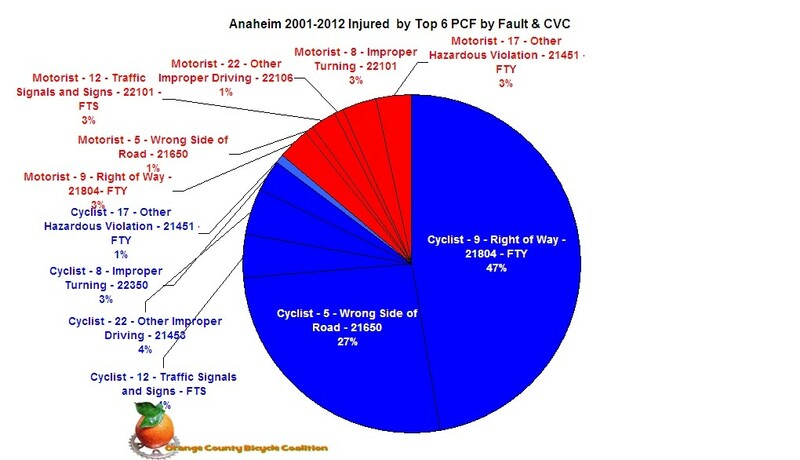 Let us know who you are and we’ll help guide the process transforming Anaheim into a cycle-safe place to ride.